Published by Triangle Publications, Inc. This month’s column is a bit of a cheat, I admit, and I can’t rightly call it review because the only proper way to review a cook book–or a cook booklet, in this case–would be to actually use the recipes to prepare some dishes. Ask anyone in my family and they’ll tell you I am about as far from a cook as a person can get. One of the more unusual aspects of TV Guide, in my opinion, was (is?) the inclusion of recipes. While I was reviewing issues for my A Year in TV Guide project I didn’t keep track of how many featured a recipe or two but it was a good percentage. 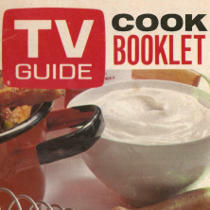 Front cover to TV Guide Cook Booklet – Copyright 1970 Triangle Publications, Inc. The first page declares that the booklet includes “a selection of favorite recipes that have appeared in America’s favorite TV magazine.” There are a total of 36 recipes printed in the booklet, split into sections like The Accent is Mexican, Clambake at the Beach or at Home, For That Special Dinner, and Beef with Style. In all, there are eight categories. Here are some of the recipes: Squash Spice Cake, Tuna Empanadas, Garlic Peanuts, German Beer Bisque, Chicken and Biscuit Pot Pie, Red Cabbage with Apples and Wine, Maharajah’s Lobster Curry, French Bouillabaisse, and Florentine Eggs En Croute. I’m curious about how the TV Guide Cook Booklet was distributed. There’s no price listed, which suggests it wasn’t sold. Was it sent to subscribers? Was it an insert in newspapers or some other magazine? If your family sampled TV Guide recipes, be sure to hit the comments and let everyone know how the meals came out. I am looking for a TV guide recipe from the 1980’s called “Calgary Steak”. Anyone know of this? I’m looking for the actress who played Opal Courtland’s split pea soup, it had leeks in it and lots of meat. Can anyone help me. I made it years ago and lost the recipe which turned into a family favorite. I had a recipe from TV Guide from either the late 1980s or early 1990s that was for Belgium Waffles. Is there anyway to locate this particular recipe? It was delicious! I’m looking for the edition that had hamburger recipes. My favorite was pineapple burgers. Wish I could see the index for this book. Looking for Persian Chicken Recipe from the 1980’s from TV Guide. I am looking for the Italian stir fry recipe!!! Some actor or actress gave it as their favorite recipe of their mom. this recipe had large shells stuffed with chicken cornbread stuffing and shredded chicken and a sauce over it, lost the recipe and forgot how to make the sauce. I’m looking for a recipe in TV Guide in 1965 or 1966. Ingredients were whipped egg whites sweetened with sugar and pureed watermelon. I seem to remember maybe freezing the mixture and eating it like ice cream or sorbet. Hi. I’m looking for the Ray Romano Hamburger Minestrone soup recipe. Thanks! I Googled it and got three Pinterest sites claiming to have Ray Romano Hamburger Minestrone Soup recipes. You may want to try a Google search.